Circle of Blue’s columnist, Dr. Paul J. Sullivan, returns this week with a look at living conditions in Haiti before the disaster. 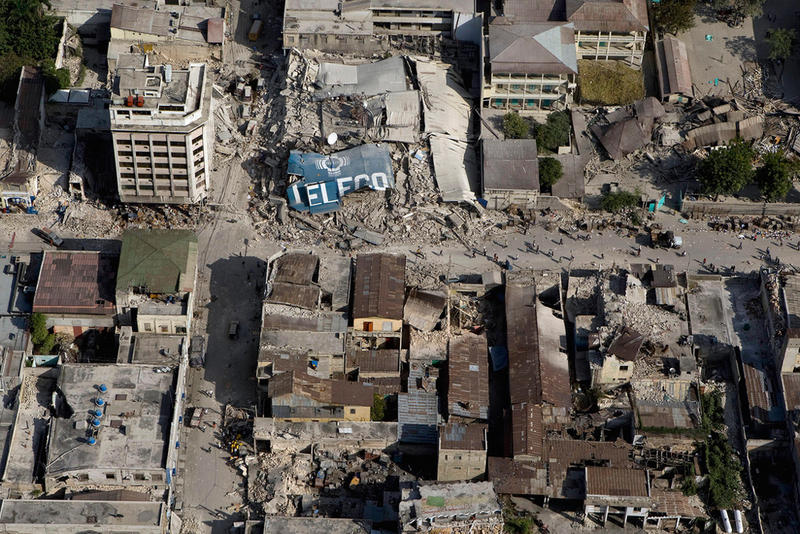 Haiti after the recent earthquake. Click to enlarge. The average GDP per capita in the country was about $600. However, if one calculates how much is owned by a very small percentage of the country, and how much of the GDP is made from these tightly controlled assets, then the GDP per capita for the average Haitian was much lower than $600. Maybe it was closer to $300-400. About 80 percent of Haitians lived on less than $2 a day while about 60 percent lived on less than $1 a day. Only about 50 percent of Haitians had some form of health care prior to the earthquake and about 3 percent had telephones. The very wealthy, the leaders of the street gangs, and the drugs dealers lived very well amidst this grinding and spirit-crushing impoverishment. About 50 percent of Haitians were illiterate, and roughly 50 percent of the school-aged children were enrolled in school prior to the earthquake. Families needed their children to help keep the family from falling even further into the sinkhole that is poverty in Haiti. But, by lacking education, they remained stagnant, falling further. It is all so terribly sad. Unemployment prior to the earthquake, and for many years previous to it, was about 50 to 60 percent. Skilled labor is scarce. The opportunities to get skills is even less. Most Haitians are trapped in the stagnant, debilitating addiction called chronic and intense poverty. The country has been on the economic life support of foreign and remittance labor from expatriates for years–now it is in economic cardiac arrest. Six of the most important resource insecurities and paucities Haiti faces are energy, clean water, sanitation, deforestation, land degradation and coral reef degradation. These are all intimately interconnected in this land of devastation and destitution. About 70 to 80 percent of Haitians had no access to clean water prior to the earthquake. A very small percentage of people had access to piped water, and this was mostly in the cities. Sewer systems and wastewater treatment were close to non-existent. Only the very rich or the very lucky had access to water treatment from privately-owned systems or from systems donated by well-meaning, but very much stressed NGOs and aid organizations. There was little access to safe water and the rates of water poisoning from bacteria and disease were very high. Many children and others died from water-borne illnesses over the years. Maternal mortality was quite high in part due to the lack of clean water. In the rural areas only about 45 percent of the richest groups had access to safe water. Now think how the poorest live. In all of this there is a stunning bit of data that also reminds me of Sub-Saharan Africa. Haiti uses only 8.3 percent of its available renewable freshwater resources (other sources peg this figure at 7.5 percent) even though many children in school and workers on the job often go the entire day with little to drink. Only about 13 percent of Haitians had legal access to electricity. When you add in the stolen electricity maybe 25 percent had access to electricity. Electricity was produced by three small and decrepit thermal power plants, which are fueled by imported oil products since Haiti has no refinery, and a feeble hydropower plant in the hills near the Dominican Republic, the Peligre Dam, which took over 20 years to build and much less than that to rot into a shadow of its effective self. Haiti had one of the lowest demands for electricity per capita in the world. It had the worst electrical system in the Western Hemisphere. The main port for importing the fuels for the thermal plants is damaged and the plants may also be quite damaged. Given that Haiti is disaster prone maybe one of the best solutions for Haiti for its energy poverty and insecurity is to set up non-grid electricity. Some options include solar, wind, geothermal and other renewable and off-grid energy sources. Off-grid power is less prone to systematic collapse during and after disasters. It could also be a much less expensive way to improve electricity access to those in the rural areas and poorer areas of the towns and cities who have been outrageously underserved. Large electricity grid connections are very expensive to build and fairly easily subject to damage by natural and other disasters. It is clear that Haiti’s thermal and hydro generating stations are in grave need of repair and much better management and maintenance. It is also clear that for Haiti to rebuild it will need energy and lots of it. Right now it has very little financial, skill, management, administration and leadership capacity to make this happen. Energy is required to clean and to move water. But, then again, you need the energy, finance and leadership to build the water transport and distribution system to get the clean water to the people first. In most areas of Haiti this does not exist. In many of the hill areas people relied on streams, often polluted and filthy, for their water. Piped water is rare in much of Haiti. And this is a country not far from our coast, and a neighbor in need. Energy starvation in Haiti has also been intimately related to deforestation, land degradation, coral reef ruination, and the lowering of fisheries and land agricultural yields. The main source of energy for Haitians has always been biomass. This has usually been in the form of charcoal briquettes and other energy forms developed from chopping down trees and gathering up agricultural and other waste for cooking, etc. The aching drive for energy has massively deforested the country. Attempts to turn this around seem to have had minimal impact relative to the overall problem. As the trees were uprooted and destroyed, the best soils washed away. The ability of the land to hold the precious water of Haiti was also uprooted. Some of the soil that washed away went into the sea and damaged some of the coral reefs. This damaged some of the fisheries. There have also been devastating land and mudslides. Expect more of these. To be fair, however, if you were desperately poor and had no other way to cook, and you were illiterate and had no knowledge of the effects of your actions and you needed to do what was needed to do for your family’s survival what would you do? Add to all of this that indoor cooking with biomass is a huge source of health problems in Haiti and we have a vicious circle of water, energy, land, and other resource poverty circling about in the midst of economic, educational and knowledge poverty, which is in turn circling about in health poverty. Electricity, be it from grid power or from distributed solar, wind, etc. can also make medical clinics more viable. Energy helps keep medicines cool and helps sanitize the water, instruments, operating tables and more that are needed in hospitals and clinics. The energy-water connections can help develop jobs and the dignity that goes with them. The negative synergy of interconnections amongst energy, water, land, food, health, jobs, education, leadership and more have lead to devastation and destitution in Haiti so far. Those same synergies can be turned positive by the proper leadership, investments, training and education, for Haitians, and with considerable help from those outside of Haiti. In no way does the average Haitian have the financial capacity to rebuild after this. Mismanagement, corruption and just plain venality are not victimless crimes. Poverty is not a victimless existence. Leadership is required to turn this situation around. Sadly, I doubt anybody expects this great and benevolent leadership to move into the crumbled presidential palace anytime soon. The next time you leave the tap running and the lights on you might want to think of Haiti. Most people there can do neither and never could. Read more on the health conditions in Haiti, and the pre-quake living conditions in the country. Nations are now asking us this very question about Haiti. Haiti is one of our neighboring countires and we have a duty to help her and her people. My initial response to rebuilding a nation would be to start with its children and educational system. However, it is quite clear that when there is a problem obtaining basic resources as simple as clean water, it is going to be a challenge to keep kids in school. But how do we fix the resource problem? It is a product of poor leadership and mismanagement. So it seems that the US is once again in a position of “reforming” another countries leadership. Embarking on such a mission is sensative. We have done so many times in the past and yet have not always been successful. How should the US intervene in another coutries leadership without giving off an attitude of superiority? Perhaps now is the best time for the US to intervene because, sadly, Haiti really has nothing left. The best place for the nation to start would be from the beginning. When we look at what we have to start with and where we must go, it is evident that rebuilding Haiti is a daunting task. Look how long is has taken for us to rebuild our own city of New Orleans after Katrina. I think our question for Haiti is how do we begin? My heart aches as i read the situation in Haiti. If only there is good governance and Haitians would learn to care for their fellow Haitians, then life there would be better. Strret Gangs, DRUG DEALERS! It’s a problem of other countries too. But in Haiti, it worse. Christ! Somehow, the good in the heart every Haitians must come out and they should begin helping each other. The wealthy should at least learn to share. and now, Haiti was stricken with such as a disaster. God bless them! They really need just some help but a big help!